I remember hearing about this book in Entertainment Weekly, which, by the way, is where I get most of my book recommendations from. But I didn’t remember anything from the review, other than the praise the book received. In a nutshell, this is a coming of age story for Julia, a sixth grade girl living in California. A bit of a loner and not very popular, Julia views life happening as an outsider. And then, the Earth’s rotation slows down by about a half hour one day. As each day passes, the rotation becomes slower and slower, and days become longer and longer. Society must adapt. But gravity responds differently, and some animals are unable to adjust. It’s a scary world, but everyone must continue on with their lives. Some choose to go with the flow; others form splinter groups that buck the system. This book is fascinating in that it imagines a world completely changed and yet all the pressures of society still exist. Those who don’t go along with the new clock are ostracized, targeted for vandalism and violence, and driven to the outskirts of civilization. Similarly, Julia still feels lonely at school, longs for her crush to notice her, and buys her first training bra. 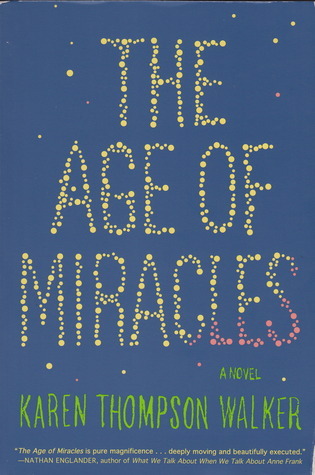 Superbly written, “The Age of Miracles” captures the uncertainty of youth as well as the unpredictability of the world we live in. I flew through the nearly 300 pages, and longed for more. Well worth putting some of my other TBR’s on hold to squeeze this in.